Complete with verse references, My Little Life of Jesus also features a map of the places Jesus lived and a presentation page for gifting. Pictures fill each page, holding kids' attention as parents and caregivers read the sweet stories to them. The stories are just the right length to keep preschoolers interested as they learn about the major events in Jesus' life. "Many sick people came to Jesus. People with bad backs and bad legs. People who couldn't see and people who couldn't hear" (p. 41). 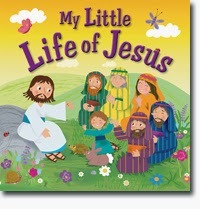 My Little Life of Jesus is a sweet retelling of these parts of the Bible, and it is a nice way to expose young kids to the Gospel. The publisher sent a review copy for my honest opinions.